With a Beaver Colony, two Cub Packs and two Scout Troops lead by a dedicated group of volunteer adult leaders and supporters, there is plenty of fun to be had by all whatever your age, skills, backgrounds and interests might be. Please take a look around our website to get an idea of what we get up to and if you have any questions or would like to get involved then please Contact Us. 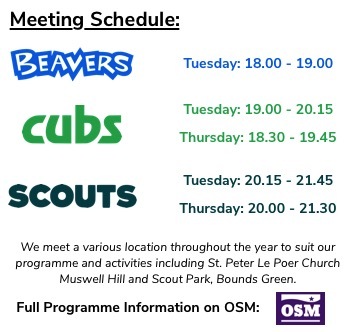 A reminder that there are NO Beaver, Tuesday Cub or Tuesday Scout Meetings this evening.